What is Realms of Atrothia? Adventure through a whole new world with lost civilizations, unexplored jungles, and political intrigue abound. Dine with the Hegemony of Kalmarune's vampire aristocracy. Contend with the Trennian Empire's claim of national superiority through widespread use of black powder. Push back the ever-expanding armies from the forsaken lands of Xer-Kol whose fanatical peoples serve the whims of the god of corruption bound within their borders. The Realms of Atrothia await. Sunburst Games is proud to announce its first hardcover release, Realms of Atrothia: Primary Expansion, currently in development and play-testing, with an expected release in August 2019, this hardcover will surely be the newest addition to any Tabletop Gamer's library. Building upon the legacy of the Pathfinder Roleplaying Game, and the existing d20 game system which is over 35 years in the making, Realms of Atrothia: Primary Expansion includes all new game mechanics, and player options. Featuring the Realms Campaign Setting, the Ascended system for running a game beyond 20th level, and expanded player content, including new archetypes, base classes, feats, gear, magic items, races, and spells, Realms of Atrothia: Primary Expansion is sure to capture the imaginations of Players, and GMs alike. Get ready for a whole new world of adventure, inspired by limitless imagination! Packed with over 95 playable races, Realms of Atrothia: Primary Expansion features an expansive array of racial options including Alternative Racial Traits, Favored Class Bonuses, Racial Archetypes, and Racial Feats. Including fully re-balanced Legacy Races already seen in the Pathfinder Roleplaying Game, as well as new Primary Races such as the Caitsith, Half-Troll, Hecavus, and Immortis. If that's not enough, get ready for dozens of Monstrous Races such as Dracolyte, Gargoyle, Oni, Moonbeast, and Yeti, all of which are ready to play right from level 1, but don't worry GMs, your PCs won't be full strength monsters until they have pursued the new Exemplar Primary Class. 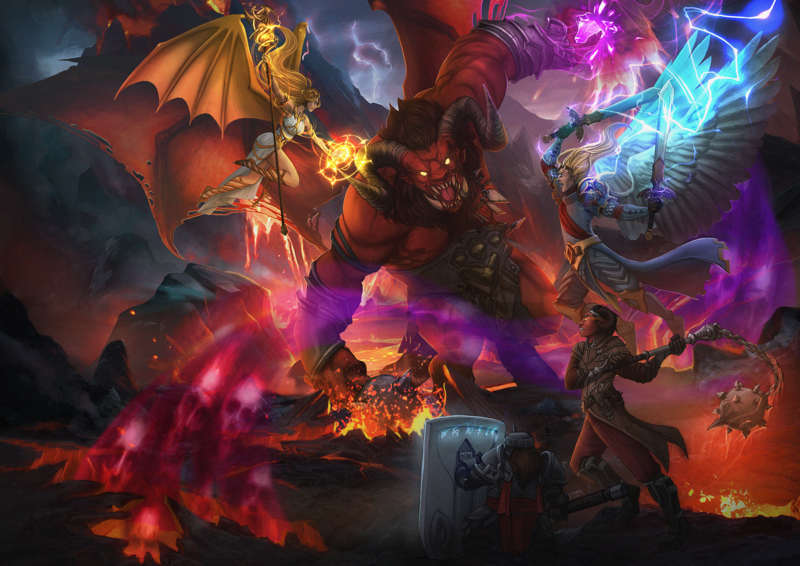 The new heroes have arrived with Realms of Atrothia: Primary Expansion. Featuring 7 new Primary Classes including Artificer, Erudite, Esoteric, Exemplar, Knight, Priest, and Spellsword, as well as dozens of new Class Archetypes for both the Legacy Classes already seen in the Pathfinder Roleplaying Game and the Primary Classes. Get ready for a whole new world of adventure! Realms of Atrothia: Primary Expansion includes a new Campaign Setting, the World of Atrothia. Featuring over 25 new deities, including the redeemed knight Davros, and the corrupter Xeronoth, and more than 50 regions to explore, such as the undead aristocracy of the Hegemony of Kalmarune, the pinnacle of prosperity that is Palisade, and the unexplored reaches of the Mogen Wildlands. The Pathfinder Roleplaying game is a Tabletop RPG based on the d20 game system. Learn more about the Pathfinder Roleplaying Game at paizo.com.